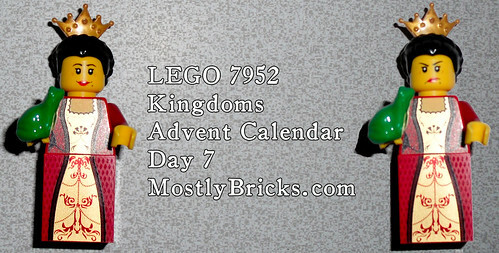 We are now on day 7 of our LEGO 7952 Kingdoms Advent Calendar posting, and today’s entry is a minifig and her pet, which happens to be a frog (Frog Prince or Frog Princess reference anyone?). No, you do not get two princesses – we’ve included two separate photos showing that she has a double-sided head. One is happy with thoughts of a handsome prince upon kissing the frog. The other has kissed the frog. If you want to see larger versions of any of the advent calendar entries we’ve posted so far, or just want to see all of them, check our LEGO 7952 Kingdoms Advent Calendar Gallery at flickr.